Thursday February 20 1908 It was 63 years today since Father & Mother were married Dear old Father not here with us now. I cannot believe it I was busy with the work till nearly the middle of the afternoon I baked bread and fried doughnuts, and dressed chicken The boys took the last of the hay out of one of Mrs [Kovers?] bar. I sewed what spare time I had. weather some milder. 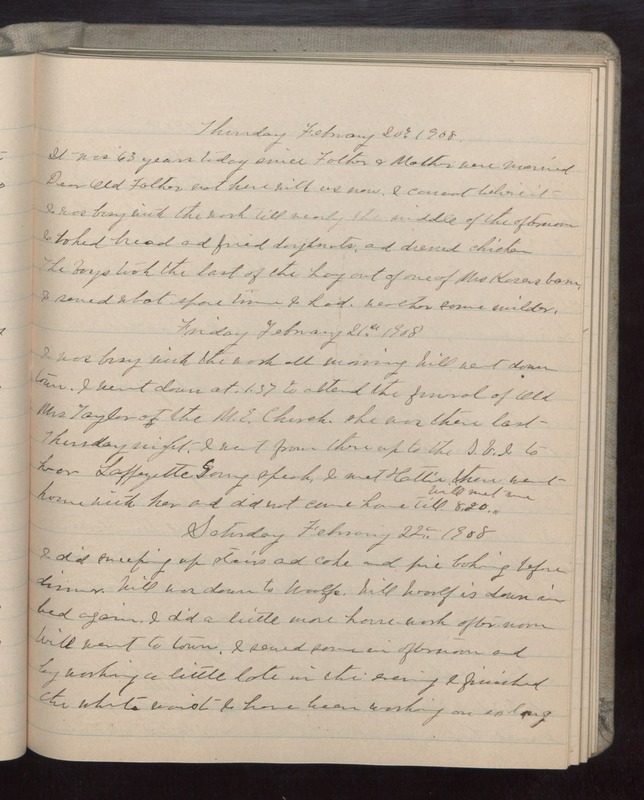 Friday February 21 1908 I was busy with the work all morning. Will went down town. I went down at 1.37 to attend the funeral of old Mrs Taylor at the M.E. Church. she was there last Thursday night. I went from there up to the [S.V.I.?] to hear Laffeyette [Goring?] speak. I met Hattie then went home with her and did not come home till 8.20. Will met me. Saturday February 22 1908 I did sweeping up stairs and cake and pie baking before dinner. Will was down to Woolfs. Will Woolf is down in bed again. I did a little more house-work after noon Will went to town. I sewed some in afternoon and by working a little late in the evening I finished the white waist I have been working on so long.